Samsung to launch foldable phone 'early next year' | What Hi-Fi? We know: it was meant to happen this year. 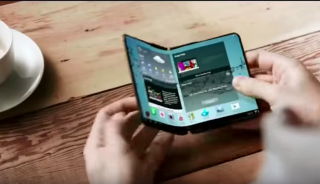 Samsung has been teasing the foldable phone concept for a while (it first revealed a foldable prototype called Youm as far back as 2013) - and it’s not the only one, with Apple and LG also rumoured to be finalising foldable phones. Samsung had originally hoped to release its first bendy blower this year but now looks set to finally get it onto shelves in 2019, according to unnamed Wall Street Journal sources. ‘People familiar with the matter’ have told the Journal Samsung plans to introduce a foldable-screen smartphone ‘early next year’ - so we may yet see it at MWC. The handset has been codenamed 'winner' – a good omen, perhaps? – although, as per previous reports, it’ll more likely be called ‘Galaxy X’ on release. The prototype supposedly has a 7in screen and can fold in half ‘like a wallet’. When folded, the device will also have a smaller visible front display, with cameras on the back. Patents have previously suggested it could be closer to the size of a tablet than a phone, which the reported screen size does nothing to counter.